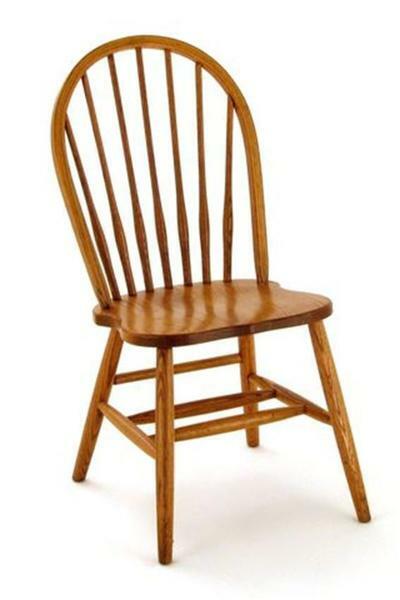 This Amish Windsor chair design has been around since the 17th century and is still just as popular. The Amish Spindle Bow Back Windsor Chair is the perfect selection for your country home or early American home. This old English style Windsor chair offers an antique look but is brand new and built for each customer. Every solid wood dining room chair we offer is built using quality construction. This Windsor features a curved chair bow, steam bent chair back, seven tapered spindles and your choice of turned or plain legs. This combination makes the classic Windsor chair look beautiful in your home dining room or business setting. The chair is shown with our plain leg which gives it a more contemporary style but by choosing the fancy, turned leg you transform the look of the Windsor. Pair these light Windsor chairs with a pedestal table to create a true Colonial dining room look. 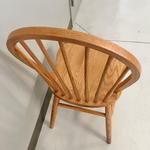 This Amish Windsor Chair is handcrafted from solid red oak wood, brown maple wood or hard maple wood. Call one of our Amish furniture specialists today to receive wood finish samples to help you make your stain or paint selection. Custom finishing is also available for these Windsor chairs. This Amish woodworker is able to customize these chairs to your specifications or build them for commercial use. Visit our Contract Furniture and Trade Sales page for more information or call us at 1-866-272-6773 for a quote. You can also visit our brick and mortar furniture store in Sarasota, Florida. Bring some Colonial Furniture into your home with our Amish Spindle Bow Back Windsor Chair. The chairs arrived today… Amazing! Also, please allow me to thank you and your team for delivering these so quickly. You all went out of your way and it was much appreciated. We bought the spindle bow back Windsor high chairs to go with the dining chairs and barstools to furnish a historic restaurant in Columbia State Historic Park. They are all beautiful and of excellent quality. I would recommend Dutch Crafters to anyone needing to purchase a quality, well designed product. We received our chairs yesterday and they are beautiful. Thank you and everyone else at Dutch Crafter so much for all of your help.